Okay okay. One more day of sunshine for my milky white legs. The weather has been kind to us the past two days with mild temperatures and a weak, but shining sun in the sky. My first day at this new university felt a lot less perfect. I got extremely nervous for the introduction session yesterday at noon. So much so, that I did not eat any breakfast or lunch and those who know me well, will know that that’s not very normal. With my body running on nothing but pure adrenaline I walked around my corner to the M-building, where the session was planned. I love that I live this close to my classrooms now. There were a lot of people there. And I even knew two of them! One had been in High School with me – um, three years ago already? – and a girl that studied Social Work with me was waiting there as well. You do not want to know how awkward I felt when both failed to recognize me and I was left standing in the middle of a giant mass of first-time students with no one to talk to. I suddenly felt incredibly lonely. The session past, still not talking. I went to the boyfriends apartment while he was out celebrating the new school year with his friends, and played the new GTA5 until my eyes couldn’t handle the TV-light anymore. The boyfriend and his friends came by with pizzas and then I went to my own place again. My upstairs neighbors were throwing a party while I crawled into bed and felt the tears coming. What the hell am I doing? Today was better. I bought Oreo’s (always a good idea) and went to my first class. At first I was alone again. But then a girl came in and asked if she could sit next to me. Hallelujah. We talked a little, not too much. Then our class got cancelled and the magic was broken. But it raised my spirits enough so that I am now writing this blog post instead of playing GTA. Well… Maybe I’m still in the mood for a game. Let’s go play! And I’m sorry for the poor image quality. Blogger’s uploading system is to blame! Aw, I am sorry you had such a rough day 🙁 You look looooovely in that dress though! First days are always tough. I transfered to a new college and didn't know a sole with a roomate I had never met (she turned out to be crazy with a capital C). It took some time but I eventually made friends, many of whom are my best friends still today. Just give it some time. Eerste dagen zijn altijd moeilijk. Ik zie mijzelf ook nog altijd die gigantische aula binnenkomen op mijn eerste schooldag aan de unief. Morgen heb ik kennismaking met de masterstudenten, waarvan ik ook niemand écht ken. Ben dus ook een beetje zenuwachtig, maar geloof mij, het went met de jaren. Nu ik al 3 jaar 'zelfstandig' ben en vaak ook wel eens alleen in de les zit, ben ik getraind in contacten leggen. Al is het maar een kort gesprekje, er zijn zovéél mensen die alleen zijn. Meer dan je denkt! Nog heel veel succes de komende dagen, die eerste week (en het komende jaar) is zo snel om, geloof mij! first days are always the hardest! het komt wel goed.. Veel suces! A lot of first days go like that. You just started! Don't give up 🙂 When I started college, I didn't know anyone either. But now I've been graduated for a few years and am STILL hanging out with the life-long friends I made while I was there. At least you looked adorable! You will meet people. Its tough, but it will happen. I had a terrible and lonely first semester at my last uni. I finally started meeting people when I joined a school group of students with similar interests. Maybe look into clubs and such? And how great that your bf is close! You aren't alone! It's tough at first, but it always gets easier! Don't let it get you down. Also, you look fabulous. I'm loving those fall colors on you! I'm so sorry Nikki! I can totally relate- in fact this is me every day being a full time student. It can be really hard to get into the swing of things and start meeting people. I will keep you in my prayers! Ik had dat ook de eerste keer op de unief, ik kende helemaal niemand maar serieus, na een paar lessen leer je sowieso mensen kennen (ik ben ook niet de sociaalste) dus het gaat wel over 😉 Veel succes! I'm sorry about your crappy day! Meeting people is hard, but you'll make friends! It will most likely be when you're least expecting it! At least you looked super cute! Love your heels! First off- I adore that dress and I adore you in that dress. Second… Meeting people is hard and awkward. But you made progress with that girl who asked to sit by you, and as for those other two you recognized- well, they may have been shy and thinking you didn't recognize them either. I hope (though I would be scared to do this myself) you take the initiative and ask to sit by some people or maybe even see if they want to grab a cup of coffee or something! Things get easier as routines get going. Also, hopefully, that one neighbor will have homework and not be able to party as much. Aww I hope it gets better! First days are always so hard, but once you make the first friend, it all gets better! i'm the same, it takes me awhile to open up to new people, but once the awkwardness (which is generally me talking too much in fear of silences) passes, its all worth it. My first week of classes went the same. Things will get better with time!! I'm so sorry to hear that you had a bad first day 🙁 I've always been extremely social, but I honestly felt quite shy when I started college three weeks ago. I hate the awkward small talk and feeling like you need to prove yourself to people in order to make friends. Just remember to stay true to yourself and you'll find people who are genuine and caring, too! I've also found that giving compliments to cute girls really boosts their confidence and makes them want to talk to you! A simple "I love your scarf today" always starts a conversation! I'm sorry you had a bad first day at the new university, but you will meet kind people like you. I believe that God brings the right people into our lives, so it's just a matter of time before they show up. Your best days are still in front of you. It's so good that your boyfriend is close and you will support each other. I wish you have happy days in this new university and accomplish your dreams. Your dress looks so beautiful on you and the shoes are perfect with this dress! Sorry you had a rough first day, but it seems like it will just keep getting better. 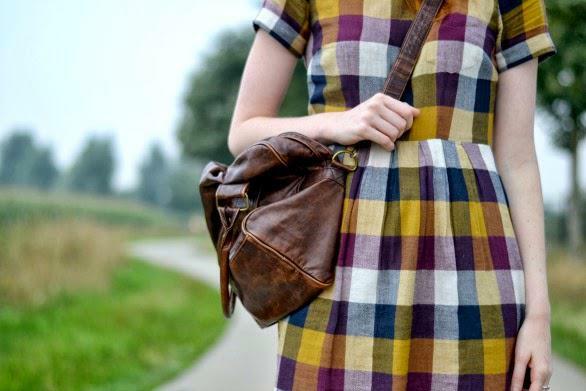 Love your plaid dress, it's so perfectly fall! I hope you are able to at least start an in-class friendship with the nice girl from your second day. It's so nice to have a friend in class with you! IT'S AWESOME. Though, you can't hit everything and therefor crash a lot and sometimes your car explodes without a clear reason. But I've been loving the extensive free roam options! So much fuuuun! I am way to nervous to do this, but after this third day I'm getting to know a few faces and it help that we all see each other every day. Now I start to know who else is alone and we're sitting together in class. I feel super relieved! Thank you for your kind words Kristian! Great idea! I have been thinking about that as well. The club related to my study organises a lot of cultural trips (think opera, concerts and citytrips) that I'd love to go on but I haven't found their stall yet so I haven't been able to register haha! Terrible first day maar incredible outfit cutie! I know, right! When you are a grown up, making new friends is hundred times more difficult than it was being a child. At least you could just share a toy. But now it needs more thought and effort put to it. 🙂 I am sure the new place will become like home pretty soon! But you looked really good doing it 😀 Really! Im sorry you had such a bad first day! But you should know you have AMAZING, long legs! I know exactly how you feel!! But trust in me, you'll find a lot of friends! !I ound my boyfriend and a lot of friends too! !Just talk, say something, you'll never do a wrong thing!! Love this dress! The shoes look so good with it! College feels extremely weird sometimes when you don't fit into the "get drunk until 2am" crowd. It will get better! And you totally should come to Texas to feel the heat. It's perfect right now – hot in the day, fresh and cool at night. Hope university gets better and that you find a ton of new friends! I'm sure there are plenty of people searching for a friend, so just give it time. On the bright side, you look absolutely adorable! Het wordt beter! Ik had exact hetzelfde gevoel op mijn eerste dag en daarna is alles goed gekomen:) Veel succes alleszins en keitof kleedje! Bij mij was dat in het begin ook niet evident hoor, maar het wordt sowieso beter! i'm sorry to hear you had a bad first day but it will definitely get easier and you will meet a lot of new people and make friends with them, everyone else is probably just as nervous as you are. hope you're feeling better about it all by now! Aw I'm sorry the introduction session didn't go well. Sometimes getting some rest makes everything seem so much better though. At least the next day was better! I really would love to play GTA5 sometime soon. I've heard it's really great. en je leert vast nog mensen kennen, die eerste dagen zijn voor iedereen een beetje onzeker en eenzaam. Veel succes met je tweede week en maak je maar geen zorgen want het is heel normaal dat je je de eerste dag(en) wat akward en onwennig voelt :). Die vrienden gaan automatisch komen en waarschijnlijk zitten er nog zo'n honderden in uw les die hetzelfde gevoel hadden :)! Mijn eerste les was ook vrij eenzaam en halverwege het jaar hadden we een hechte groep van 10 man ofzo ;). Geniet er allesinds van!! That crowd seems to reside in the studio right above mine. Gosh, they make so much noise! Thank you for your comment, do you have a blog too? I'd love to see it! The cutest plaid dress i ve every seen! Je mag me altijd smsen als eens een eenzaam momentje hebt, maar ondertussen zal het al wel beter zijn zeker 😉 Die schoenen en jurk zijn zoooo mooi tesamen btw!